At what point will vulnerability assessments be performed once Insider Threat Prevention is put into production (e.g., ongoing Risk Management after implementation)? How do you determine the key elements that affect Insider Threat Prevention workforce satisfaction? how are these elements determined for different workforce groups and segments? What are the success criteria that will indicate that Insider Threat Prevention objectives have been met and the benefits delivered? What will be the consequences to the business (financial, reputation etc) if Insider Threat Prevention does not go ahead or fails to deliver the objectives? Is there a Insider Threat Prevention management charter, including business case, problem and goal statements, scope, milestones, roles and responsibilities, communication plan? This book is for managers, advisors, consultants, specialists, professionals and anyone interested in Insider Threat Prevention assessment. Using a Self-Assessment tool known as the Insider Threat Prevention Scorecard, you will develop a clear picture of which Insider Threat Prevention areas need attention. 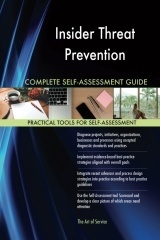 Included with your purchase of the book is the Insider Threat Prevention Self-Assessment downloadable resource, which contains all questions and Self-Assessment areas of this book in a ready to use Excel dashboard, including the self-assessment, graphic insights, and project planning automation - all with examples to get you started with the assessment right away. Access instructions can be found in the book.